The original Vikings used the world"s waterways and oceans to expand their knowledge. In the same spirit, Viking River Cruises takes its guests on a journey of exploration and discovery – all from the comfort of its elegant vessels. As an integral part of their ongoing post-cruise dialogue with their guests, Viking were looking to provide a very high-quality, coffee-table style book as a gift for each guest to receive upon returning home. 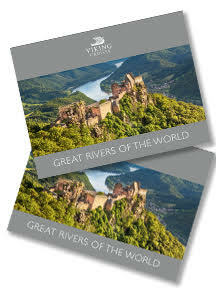 Following straight on from the recent success of publishing the VIKING LONGSHIPS book, REM Productions were asked to design and deliver this project; GREAT RIVERS OF THE WORLD was the result – a richly-illustrated book designed to inspire guests to join Viking River Cruises for further journeys.